Ivanka Trump didn’t stop dad’s attack on trans people, but she did appear on The Hill's 50 Most Beautiful list. No public statements from Ivanka today, but she DID appear on The Hill’s 50 Most Beautiful list. On Wednesday morning, when Donald Trump tweeted his intention to bar all transgender people from serving in the U.S. military, one major question bubbled up on the social feeds of LGBTQ Americans: Where’s Ivanka? Last we heard, she was wishing us a happy Pride month and boasting that she was “proud to support … celebrate and honor” her LGBTQ “friends” and other queer people “who have made immense contributions to our society and economy.” That’s a lovely sentiment to share in the party month of parades, glitter, and Babadook harnesses. But Ivanka Trump’s professed support never actually led to concrete gains. Instead, she has stood by in public silence as queer and transgender people grappled with her father’s personal, unjustified attack on thousands of U.S. servicemembers we’re usually told we should hold in utmost reverence. She issued not even a perfunctory tweet of recognition that the administration she serves has made millions of Americans feel unworthy, less safe, and expendable today. The LGBTQ people who, in Ivanka’s words, “have made immense contributions to our society and economy”? According to Trump, they are a “disruption” to the military, which should not be “burdened” with their health-care needs. The only thing Ivanka has done today is appear on the Hill’s annual “50 Most Beautiful” list of political operatives, journalists, and advocates. And so her LGBTQ “friends” have been left hanging by their one tenuous, beautiful connection to the White House. That’s the tough thing about allyship, from a wannabe ally’s perspective: It means nothing without vocal advocacy and meaningful action. Even if she has hounded her dad on other LGBTQ issues in private, as some have claimed, her decision to stay publicly mum on this subject is a damaging one. This wouldn’t matter so much if Ivanka hadn’t been trying like hell to sell herself as an instrument of moderate restraint in Trump’s administration since the very beginning of his term. Trump says she is “always pushing me to do the right thing,” and in every possible interview, Ivanka portrays herself as a sane “proactive voice” amid the more radical right-wingers. Anonymous sources from within (or dispatched by) the White House have been very kind to Ivanka, crediting her and husband Jared Kushner with convincing Trump to be a bit less cruel to women, LGBTQ people, and the poor and marginalized populations that are suffering most from the effects of climate change. That hasn’t happened, an obvious fact to anyone who’s been paying attention to the administration’s actions that have condemned women, trans children, and the planet to certain indignity or physical harm. The Daily Beast quotes one “senior White House official” as saying on Wednesday that Ivanka and Kushner decided their “political capital” should “be spent elsewhere” than on maintaining the military’s current open, inclusive policy on transgender servicemembers. The rest of us are still waiting to see the returns on whatever meager quantity political capital they’ve allegedly spent on some unnamed, unknowable issue. Even besides her Pride tweet about supporting all those hardworking LGBTQ Americans, too many of Ivanka’s social media posts look like surface-level attempts to appease marginalized demographics she is simultaneously helping to persecute. She recently posed for Instagram photos with high-schoolers in town for the international FIRST Robotics Competition. Several were Muslim girls wearing headscarves; others wore West African dashikis. 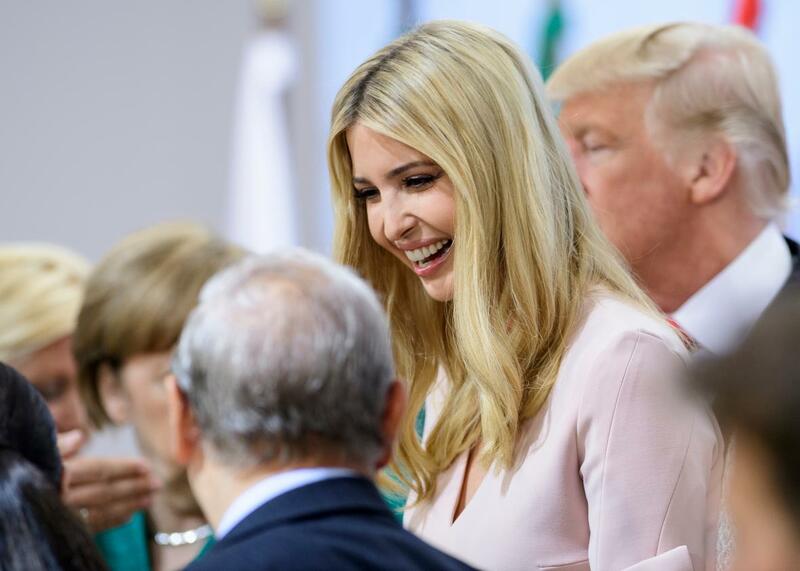 In the photos, Ivanka looks so pleased and proud to meet young women from around the world. Yet she has been noticeably silent on her administration’s Muslim travel ban, inflammation of Islamophobia around the country, and decision to hold $8.8 billion in global health aid hostage in the interest of advancing anti-abortion policies, potentially cutting off vital family planning and HIV-prevention resources for people in grave need. A photo op with Afghan students whose visas Trump withheld until the last possible moment constitutes an insult to their families, friends, and neighbors who are suffering under his policies. So far, Ivanka’s allyship with queer people has consisted of self-congratulatory posts and unverified claims to political action no one can see.